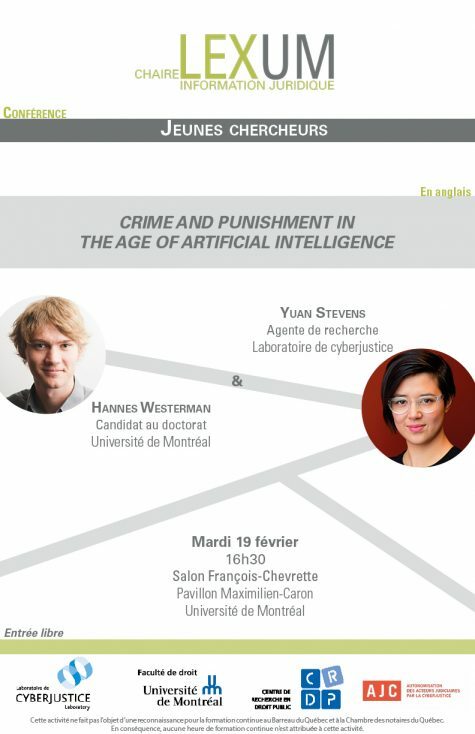 Dans le cadre du cycle de conférences Jeunes chercheurs, la Chaire LexUM en information juridique accueille Hannes Westerman, candidat au doctorat en droit à l’Université de Montréal, et Yuan Stevens, agente de recherche au Laboratoire de cyberjustice, qui présenteront une conférence qui s’intitule « Crime and Punishment in the Age of Artificial Intelligence » (En anglais). Artificial intelligence (AI) is one of the most promising technologies of recent years. By sifting through and detecting patterns in enormous datasets, it allows computers to learn about the real world and predict unseen future cases. Recent advances have allowed AI to begin to enter areas previously reserved for humans, such as driving cars and recognizing spoken voice. AI has the potential to affect all areas of society – including that of crime and crime prevention. In this talk, we examine the impact of artificial intelligence on the landscape of criminal justice. We begin by offering a pragmatic overview of AI. We then elaborate on the use of AI by criminal actors, a topic thus far rarely discussed. Next, we talk about the use of AI to detect and prevent crime. Finally, we offer an overview of the ways in which AI is already being used in the criminal justice system, particularly in bail and sentencing decisions. Hannes Westermann is a PhD student in Artificial Intelligence and Law at the Université de Montréal. He works at the Cyberjustice Laboratory and is in charge of the JusticeBot project, which aims to enable greater access to Justice through the use of artificial intelligence. Hannes graduated in 2018 from Lund University in Sweden with a Masters in Law, focusing on privacy and big data. He spent an exchange year at the faculty of law at McGill University. Besides his law studies Hannes has been interested and active in technology and programming, e.g. by participating in hackathons and developing several smartphone apps. Yuan Stevens holds a B.C.L./LL.B from McGill University and is a researcher at the Cyberjustice Laboratory (Université de Montréal), focused on the Autonomy Through Cyberjustice Technologies (ACT) project. She also serves as a co-investigator for an independent project at Data & Society Research Institute, where she is conducting ethnographic research on “bug bounty” participants as an emerging occupational community. She serves on the board of directors for Open Privacy Research Institute, Head & Hands in Montreal, and previously worked at the Berkman Klein Center for Internet & Society at Harvard University. Cet événement ne fait l’objet d’aucune reconnaissance à titre de la formation reconnue par le Barreau du Québec ou la Chambre des notaires. This content has been updated on 02/26/2019 at 11 h 42 min.